The neglected tropical diseases (NTDs) are caused by several parasites, fungi, bacteria and viruses and affect more than one billion people in the world. The control and prevention against NTDs need implementation of alternative methods for testing new compounds against these diseases. For the implementation of alternative methods, it is necessary to apply the principles of replacement, reduction and refinement (the 3Rs) for the use of laboratory animals. Accordingly, the present review addressed a variety of alternative models to study the infections caused by protozoa and fungi. 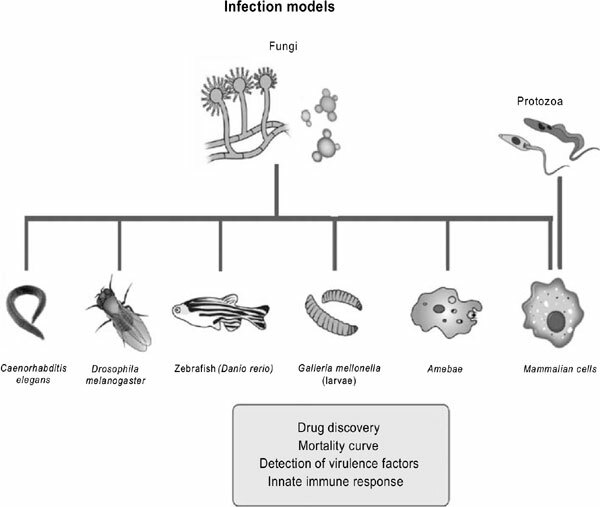 Overall, vertebrate and invertebrate models of fungal infection have been used to elucidate host-pathogen interactions. However, until now the insect model has not been used in protozoal studies as an alternative method, but there is interest in the scientific community to try new tools to screen alternative drugs to control and prevent protozoal infections. Keywords: Fungal, leishmaniasis, Chagas disease, alternative methods, alternative host models, target-based approach. Keywords:Fungal, leishmaniasis, Chagas disease, alternative methods, alternative host models, target-based approach. Abstract:The neglected tropical diseases (NTDs) are caused by several parasites, fungi, bacteria and viruses and affect more than one billion people in the world. The control and prevention against NTDs need implementation of alternative methods for testing new compounds against these diseases. For the implementation of alternative methods, it is necessary to apply the principles of replacement, reduction and refinement (the 3Rs) for the use of laboratory animals. Accordingly, the present review addressed a variety of alternative models to study the infections caused by protozoa and fungi. Overall, vertebrate and invertebrate models of fungal infection have been used to elucidate host-pathogen interactions. However, until now the insect model has not been used in protozoal studies as an alternative method, but there is interest in the scientific community to try new tools to screen alternative drugs to control and prevent protozoal infections.